Sydney Harbour Yacht Charter – has this month celebrated its 20th year of operation on Sydney Harbour. The company has been designing and facilitating boutique events for two decades on two vessels – the 92 foot A.Q.A. and 65 foot State of the Art – with both recently refurbished to provide guests with a luxurious, contemporary experience. Simon Loneragan, General Manager and Senior Captain, said the organisation was proud of the calibre of clients and events hosted over the last 20 years. The company has welcomed numerous local and international celebrity clientele, including HRH The Prince of Wales, President George W Bush, Sir Richard Branson, Will Ferrell, Robert De Niro, Sir Elton John, Tom Cruise, Kylie Minogue, Vince Vaughn, Michael Buble, Ashton Kutcher, John Travolta, the late Whitney Houston, the late Michael Jackson and the late Robin Williams. It has also been the venue for a number of high-end corporate events, including five consecutive years hosting ROLEX VIPs during the ROLEX Sydney to Hobart, Australian movie premieres for American Pie 2, Battleship, High School Musical, and Johnny English, and corporate events for the GWS Giants, NOVA Entertainment, Jose Cuervo Tequila, Virgin Money, the Invictus Games, and United Airlines and THALES. “This significant investment in the quality finishes, structures and safety of both vessels demonstrates our commitment to providing a contemporary, world-class corporate and private event venue for both local and international guests to enjoy,” said Captain Loneragan. The 92 foot Warren Motor Yacht A.Q.A. is one of Sydney’s finest luxury vessels, offering a six star cruising experience. Renowned in Sydney for her class, superior service and stunning design, it is an ideal Sydney Harbour venue for high-end corporate and private events. It comprises a main lounge, Sky lounge, large top deck and three large bedrooms with ensuites, and can accommodate up to 65 for cocktails, casual buffet dining for 45 people, or up to 40 people for formal dining. 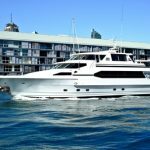 State of the Art is a custom 65 foot Motor Vessel and one of Sydney Harbour’s most sought after private charter vessels. 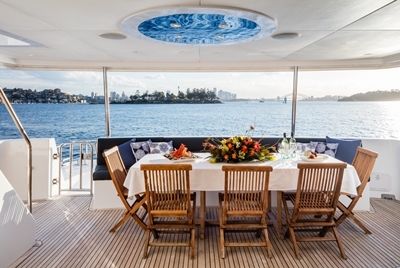 It is designed specifically for relaxing luxury day or night cruising and can accommodate 35 people for cocktail cruising, casual buffet dining for 25, and formal dining for up to 20 people.